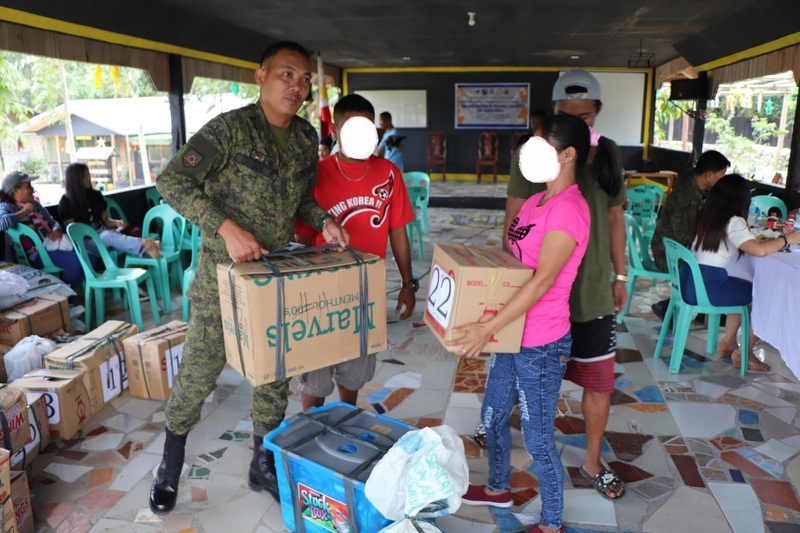 New Bataan, Compostela Valley Province – The 66th Infantry (KABALIKAT) Battalion facilitated the turn-over of livelihood starter kits from the Department of Trade and Industry (DTI) Compostela Valley Province that benefited 40 Former Rebels (FRs) on 28 November 2018. A simple ceremonial awarding of Livelihood Assistance Package was held at Headquarters 66IB that was attended by LTC PALMER M PARUNGAO, Commander of 66IB, Mr. Patrick Kim Evangelio, the Acting Division Chief of DTI ComVal and Mr. Faustino E. Diabordo, Project Coordinator of DTI ComVal. The project of DTI is in connection to the Enhanced Comprehensive Local Integration Program (ECLIP) of the government to capacitate and support the Former Rebels in going back to the mainstream society and become productive citizens. Each individual FRs was given a 20,000 worth of assistance and among of the identified livelihood projects proposed by individual FR is “sari-sari” store, Livestock Raising, Blacksmith and Hollow Block Making. Meanwhile, a former member of Guerilla front 27, @Maya delivered a testimony. She tearfully thanked the 66IB and the programs of the government for it gave them a chance to have a new life. With the livelihood that had been given to them, it will greatly help them to come-up with income generation to sustain their everyday living. “In this battalion is that we made it possible for former rebels and the soldiers to live together in harmony, building respect and nurturing appreciation from each other’s effort for the community to achieve peace and self-sustainment. I encourage the remaining members of NPA to go down, lay down your arms and surrender. The government has programs for you to start again and live a peaceful and happy life”. He added.